ROCKSTAR ENERGY DRINK MAYHEM FESTIVAL, Dean Guitars and MEGADETH are Giving Away One Guitar from Dave Mustaine’s Personal Collection at Each Festival Date! The ROCKSTAR ENERGY DRINK MAYHEM FESTIVAL is careening through the states, making its way down to Raleigh, NC tomorrow! The tour runs through August 14th and tickets are still on sale, so check in at www.rockstarmayhemfest.com and www.livenation.com to purchase your tickets! This year, the fest is taking part in an amazing promotional opportunity, brought to you by MEGADETH and Dean Guitars! At each tour stop (sans San Bernardino and Montreal), Dave Mustaine of MEGADETH has been handing off the guitar that he’s been playing each night of the festival to a member in attendance. Winners must be present to win. Check your local radio listings for more information on the contest! “It was time to invite some fans up to jam, and let them take one of these bad boys home with them,” states MEGADETH guitarist and lead vocalist Dave Mustaine. 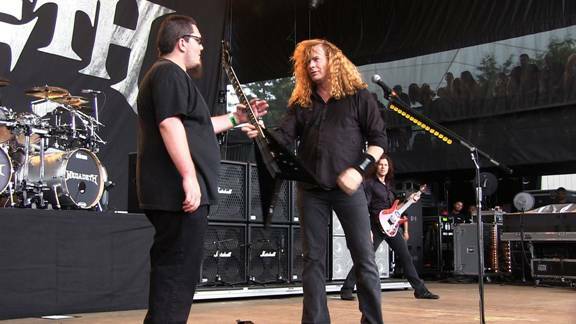 See above for an excellent photo of Dave Mustaine handing his personal guitar to a lucky fan! See below for all remaining tour dates, and make sure to grab your tickets now before they are sold out! This entry was posted on August 2, 2011 at 2:58 pm and is filed under News with tags Dave Mustaine, Dean Guitars, Megadeth, music, ROCKSTAR ENERGY DRINK MAYHEM FESTIVAL, The Rock Tribune. You can follow any responses to this entry through the RSS 2.0 feed. You can leave a response, or trackback from your own site.